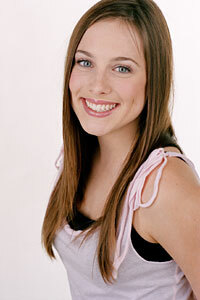 15 year old Casey is the youngest of the presenters on "Girl TV". She has an outgoing nature, winning smile and dimples to match. She is a natural, spontaneous girl who likes to have fun at all times. Casey lives with her parents and two fish Spencer and Troy. She loves all types of music and has a sensational singing voice. It was her voice that led to her being cast in the musical "Annie" over 3 years ago. This experience really sparked her love of performing and she has gone on to appear in numerous commercials and films. Casey hopes to continue as a performer throughout her life although her main goal is just to enjoy her life, whatever she does. Although Casey loves to party, she also enjoys having lazy nights in and watching movies with her girl friends. The qualities that Casey values most highly in her friends are a good sense of humour and loyalty. Casey also plays the guitar and loves gadgets like computers. Her diverse interests and lively interview technique is a winning combination for "Girl TV". Casey's one piece of advice to all girls out there is to "live life to the max" and she is certainly taking her own advice!